At Brandgarten, we are always looking for the timeless human truths brands can tap into to build deeper, more meaningful connections with their fans. So I was struck recently by the similarities between the ancient Buddhist goal of detachment from fear and desire, and the parallels to the teachings of Freud, Jung, and even the Bible, and how brands can learn from this. The story of the Buddha is that he sat down under the Bodhi tree and became the Enlightened One, neither frightened by the demons that came to scare him, nor tempted by the goddesses who tried to lure him. There, between fear and desire he simply existed. This story metaphorically points the way of detachment for all Buddhists, to live in the moment, the Middle Way, without being pulled to extremes of fear or desire. In our modern age, Freud sought to describe the most fundamental drivers of man when he suggested that at our deepest animal level, we are driven by Thanatos (death–or fear of death) and Eros (desire). C. G. Jung tried to explain our fundamental personality types and developed a model of introversion and extroversion (still used today when we take a Myers-Briggs personality test). On a very simple level, introverts are more influenced by fear of the world, while extroverts find their energy in their desire for connection with others. Christians say the Lord’s Prayer, which asks God not to lead us into temptation (desire) but to deliver us from evil. We can think about “evil” here in the way Nietszche suggests — “evil is that which threatens us.” Again, fear and desire. These ancient and modern teachings about aspirational human behavior encourage us to rise above our animal survival urges. Indeed, the most balanced, “down-to-earth” and successful people we know are the ones who seem to be able rise above this fray so well. The takeaway for brands is that a consumer’s sense of “cool” often leads them to brands that understand this detachment–brands with a firm sense of their identity that don’t try too hard to be one thing or another but just are who they are, on the Middle Way between extremes of emotion. 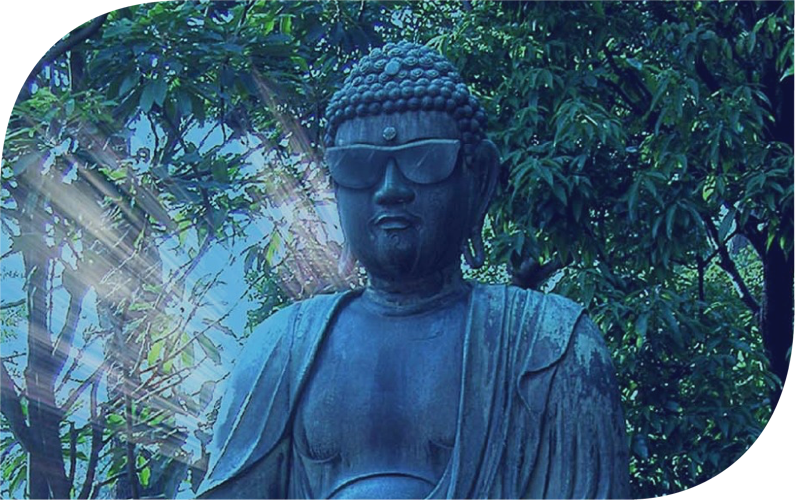 Even our word “cool” suggests “not a hothead” unafraid and unaffected — a detachment from both fear and desire behaviors–just like the Buddha.